When visitor leaves your website, idea is to show more related content and try to retain them on your website. 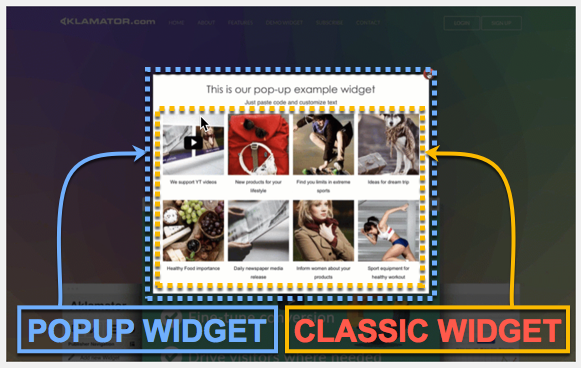 Popup widget can be show on page load or when visitor is leaveing, it is up to you to choose the trigger. Why this PopUp plugin is different then others? Aklamator will automatically populate popup widget with you content (from you website RSS feed, your YouTube channel or e.g. your instagram posts. We are not showing any third party content, you have all the control! Also, if you login to Aklamator.com you can add additional custom content to your PopUp Widget (media ads). Retain visitors and convert them to useful traffic. Average CTR better then (8% on PopUp widget)! Register now, and make your Popup plugin! Even with FREE plan you can serve 100.000 PopUP widgets each month!